A history of lower extremity ulceration increases the risk for further ulceration, infection, and subsequent amputation. The best predictor of amputation is a history of previous amputation. The transmetatarsal amputation is often performed as a secondary procedure when infection has recurred after a digital or partial ray amputation. Patients with a digital or partial ray amputation are at a higher risk for a more proximal amputation such as a transmetatarsal amputation (TMA) or a below knee amputation (BKA). The primary objective of this study is to determine the time frame between a digital or a partial ray amputation to TMA or a BKA, with a secondary objective to focus on the co-morbidities of the research patients. Our aim is to study the time frame from initial to subsequent amputations, in order to identify a “critical period” in which increased intervention may be beneficial. The study design consists of a three-year retrospective chart review of patients who initially received a digital or partial ray amputation and subsequently required a TMA or a BKA. The median time from digital or partial ray amputation to transmetatarsal amputation was 55 days. The median time from digital or partial ray amputation to below knee amputation was 21 days. 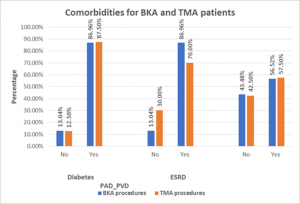 A possible explanation for the median number of days to BKA being shorter than the median number of days to TMA could be that the patients with more serious comorbidities were more likely to require a BKA emergently. The interventions during the critical period include tighter glucose control and lower extremity angiograms with close follow-up to address the underlying comorbidities of these patients. Further research is needed regarding the degree of effectiveness of these interventions and their ultimate success in limb salvage. Diabetic patients are generally at a higher risk for developing non-healing ulcerations of the lower extremity. It is estimated that 15% of patients with diabetes will develop lower extremity ulcerations at some point in their lifetime . The overall incidence of diabetic lower extremity amputations in the United States is 195 per 100,000 per year . A few of the common diabetes-related risk factors for developing ulcerations include peripheral neuropathy, vascular disease, and a history of ulceration or amputation . Microvascular and macrovascular disease are complications of diabetes. Hyperglycemia can lead to microvascular complications such as diabetic neuropathy, nephropathy, and retinopathy. Macrovascular disease can lead to complications including coronary artery disease and peripheral arterial disease (PAD). Peripheral arterial disease is commonly seen in diabetics and can result in prolonged healing of ulcerations secondary to arterial insufficiency. Additionally, PAD can lead to lack of oxygenation and difficulty in delivering antibiotics to the infection site, thus impairing the ability to resolve infections . A history of a lower extremity ulceration increases the risk for further ulceration, infection and subsequent amputation. The best predictor of amputation is a history of previous amputation [4, 5]. The transmetatarsal amputation is often performed as a secondary procedure when infection has recurred after a digital or partial ray amputation. Patients with a digital or partial ray amputation are at a higher risk for a more proximal amputation such as a TMA or a BKA . To our knowledge, the period between the initial amputation to a more proximal amputation such as a TMA or a BKA has not been well studied. Our aim is to study the time frame from initial to subsequent amputations, in order to identify a “critical period” in which increased intervention may be beneficial. The primary objective of this study is to determine the time frame between a digital or a partial ray amputation to TMA or a BKA, with a secondary objective to focus on the co-morbidities of the research patients. Co-morbidities related to the microvascular and macrovascular disease including end stage renal disease (ESRD) and PAD, respectively, will be included. The study design consists of a three-year retrospective chart review of patients who initially received a digital or partial ray amputation who subsequently required a TMA or a BKA. After approval was obtained by the Ochsner IRB, the research data miner was provided with the procedure codes and inclusion criteria. The charts were then further analyzed to see if they met the inclusion criteria. The inclusion criteria are displayed in Figure 1. Data was analyzed utilizing quantitative methods to determine the time frame from a distal amputation to transmetatarsal amputation of the same limb. Data was also analyzed to determine the time frame from a digital or partial ray amputation to a BKA or TMA of the same limb. The comorbidities of diabetes, PAD, and ESRD from the research patients were also included in the study for further analysis. Statistical analysis was completed utilizing SAS version 9.4. Tests were performed with significance level of α=0.05. Patients undergoing transmetatarsal amputation in the past 3 years of the same limb. Patients undergoing a below knee amputation in the past 3 years of the same limb. From 2012 to 2015, there were 96 transmetatarsal amputations and 91 below knee amputations performed at Ochsner Clinic Foundation. From the patients with a history of transmetatarsal amputation, 41% (40) had previously undergone digital or partial ray amputation. From the patients with a history of below knee amputation, 25% (23) had previously undergone digital or partial ray amputation. Of the patients with a history of transmetatarsal amputation, 87% (35) had diabetes, 70% (28) had PAD and 57% (23) had ESRD. Of the patients with a history of a BKA, 86% (20) had diabetes, 86% (20) had PAD and 56% (13) had ESRD. This information is displayed in Figure 2. For the patients with a history of BKA, the comorbidities of ESRD, PAD and diabetes were all found to be statistically significant risk factors with p-value of 0.0001, 0.0068 and 0.0058 respectively. Figure 2 Comorbidities of BKA and TMA patients. For patients with a history of TMA, the comorbidity of diabetes was found to be a statistically significant risk factor with a p-value of 0.00029. The comorbidities of ESRD and PAD were not found to be statistically significant risk factors in patients with a history of TMA. The median time from digital or partial ray amputation to transmetatarsal amputation was 55 days. The median time from digital or partial ray amputation to below knee amputation was 21 days. This information is displayed in Figure 3. A limitation of this study is that the complete list of comorbidities for each patient was not taken into account. Some patients may have had more severe comorbidities than others, leading to a skewed time frame between digital or partial ray amputation to TMA and BKA. Additionally, the studied cohorts were not matched in terms of age, gender, and complete list of comorbidities as previously mentioned. There was no overlap between patients included in the TMA and BKA cohorts. 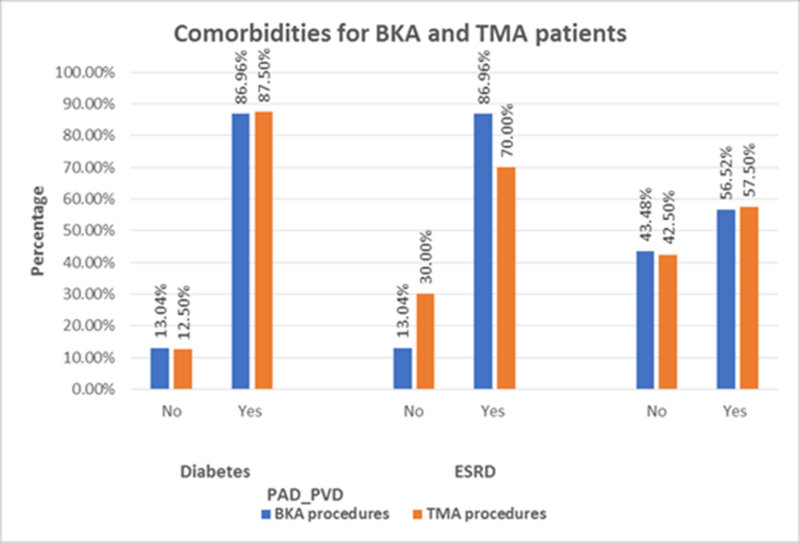 A possible explanation for the median number of days to BKA being shorter than the median number of days to TMA could be that the patients with more serious comorbidities were more likely to require a BKA emergently. However, the difference in days to a more proximal amputation was not statistically significant between the separate groups, with a p-value of 0.0709. 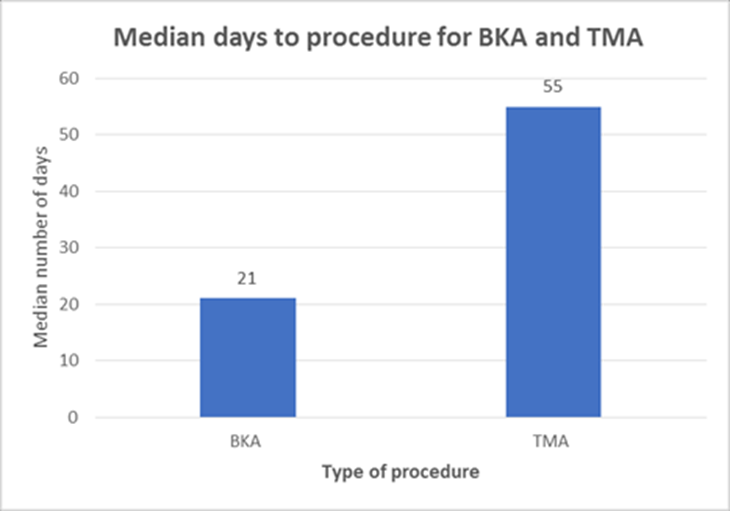 Figure 3 Median days to BKA and TMA. Figure 4 Median and range (q1-q5) of days to BKA and TMA. Patients with a digital or partial ray amputation are at a higher risk for more proximal amputations such as a transmetatarsal amputation and below knee amputation. The average time frame from a distal amputation to a more proximal amputation could provide additional information regarding the “critical period” in which intervention is key to prevention. The “critical period” for this study refers to the median time frame from a distal amputation to a TMA or a BKA, which were 55 days and 21 days respectively. 90% of patients requiring a BKA had the procedure done within 79 days, and 90% of patients requiring a TMA had the procedure done within 204 days. A conclusion that can be drawn from the data is that patients should be carefully monitored for at least two months after an initial digital or partial ray amputation. A more conservative approach, using the 90th percentile data, is to monitor patients for a longer time frame of up to seven months to reduce the incidence of more proximal amputations. The interventions during the critical period include tighter glucose control and lower extremity angiograms with close follow-up to address the underlying comorbidities of these patients. Further research is needed regarding the degree of effectiveness of these interventions and their ultimate success in limb salvage. Financial Support for this project was provided from Ochsner Health System. We would like to thank the research department at Ochsner Medical Center for their assistance with this project. Elsharawy MA. Outcome of midfoot amputations in diabetic gangrene. Ann Vasc Surg. 2011;25(6):778-82. Suckow BD, Newhall KA, Bekelis K, et al. Hemoglobin A1c Testing and Amputation Rates in Black, Hispanic, and White Medicare Patients. Ann Vasc Surg. 2016;36:208-217. Frykberg RG, Zgonis T, Armstrong DG, et al. Diabetic foot disorders. A clinical practice guideline (2006 revision). J Foot Ankle Surg. 2006;45(5 Suppl):S1-66. Fowler MJ. Microvascular and Macrovascular Complications of Diabetes. Clinical Diabetes 2008 Apr; 26(2): 77-82. Gambardella GV. Blume PA. Understanding The Biomechanics of the Transmetatarsal Amputation. Podiatry Today. 2013;26(3):46-56.